The iconic symbol is being sidelined in favor of a more general Utah State University logo as part of an initiative designed to represent all 33 USU campuses equally. 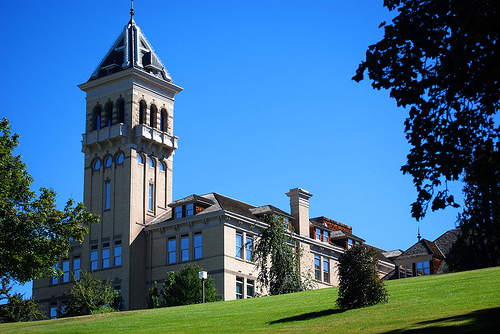 Utah State’s Old Main logo will not disappear completely, but will reserved for “many of our publications and letterhead,” said Katie Nielsen, the director of admissions at Utah State. The goal of the initiative, which began in August, is to “provide an education no matter a student’s circumstance or location,” said Lance Leatham, the manager of all marketing projects geared toward recruiting high school students to attend Utah State. spective students. By using the universal U-State symbol the Ambassadors from the different campuses will be more closely associated with each other and will be able to recruit for USU as one unit. “We want to be USU regardless of the location and are trying to make sure publications, signage, etc., look similar and are all branded Utah State,” Nielsen said. It’s not just about looks. The rebranding will also impact how the Utah State Ambassadors talk to potential students. “A major change the rebranding has brought this year is that they are no longer allowed to say ‘up at school’ or anything that would suggest they attend the campus in Logan,” said Erica Johnson, a second year ambassador for Utah State University’s Logan Campus. “The ambassador supervisors say if the high school students are unsure about which campus you attend then you have done a good job,” Johnson said. The steps being taken to begin standardizing the campuses include “centralizing all graphic designers and marketing managers within one organization, creating a brand style guide, frequent meetings with the marketing managers from different regional campuses, and careful use of logos and language,” Leatham said. This will help to emphasize that no matter which campus a student may attend the quality of education and degree will remain the same. “USU has options for students in every situation and now we have the opportunity to present those options as a whole rather than individually,” Nielsen said.